EAST CORNER! FREE Golf, Deep sea fishing,Waterville everyday! You have found your happy place! Our unit is located on the upper East side on the 22nd floor. The view is simply breathtaking! Unit is clean and well maintained. The Summer of 2016 is our first time to ever rent our unit. It is truly our home away from home. The decor is light and refreshing , cheerful yet elegant. We work closely with our service team to ensure that we maintain a level of cleanliness that we expect when we arrive, for every one of our guests. We see you as an extension of our family and hope to establish a long-term relationship like we have with so many families already. We are gracious hosts and will strive to make this your most memorable vacation ever! There is private balcony access from the living area as well as the master suite and every other bedroom. 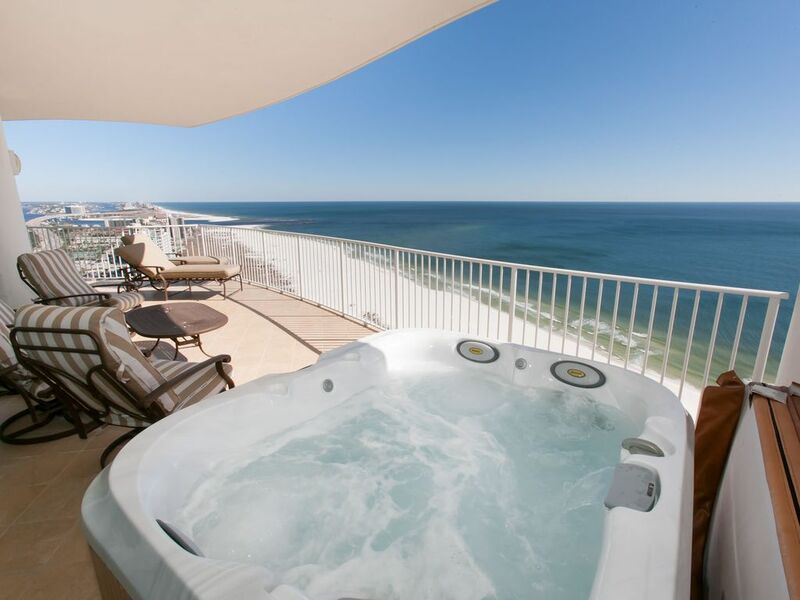 Enjoy the direct view of the Gulf from your private hot tub on the balcony or kick back and enjoy the breeze from the comfortable loungers. The outdoor balcony grill make it easy to prepare the perfect meal! This property is professionally managed by Alabama Vacation Rentals and Sales LLC. We choose the property because it's the best the Gulf Coast has to offer. We love the on site bar and grill! The live music is perfect for a sunny day around the pool. The beaches are well maintained and easy to access. Our Son loves the lazy river. We like it here because once we arrive we have all that we need to have a perfect getaway. There is a direct panoramic view of the Gulf of Mexico! 2 cars allowed for parking. State of the art fitness center overlooking the Gulf. Well stocked for preparing and serving meals. All Stainless appliances, granite tops and spacious refrigerator. Large dining area overlooking Gulf. Seating around bar area, 8 stools. Private wrap around balcony over looking Gulf. Plenty of comfortable seating. There are 6 pools on property. There is a private hot tub on balcony and communal hot tub on the 4th floor. Turquoise Place is the perfect vacation get away. It is truly an experience unlike any other. Our unit is situated in the most preferred location of the building. The upper East view is far superior then any other! The condo was awesome. Beautifully furnished. The space was just what my girlfriends needed for a great getaway. This condo is amazing. The view is absolutely breathtaking. You can see the ocean and the bay, which gives a unique perspective of Orange Beach. The condo is well stocked with the essentials, and the beds were comfortable. Another nice feature was that every bedroom had a large closet, which is nice to have when you have a large family with lots of kids. I would definitely book this place again. Actually we were changed to unit 1601. The interior of the unit was very nice. Absolutely no complaints. Did find it a little unusual that a 4 1/2 bath condominium would not have a single towel bar in the whole place. The deck furniture was lacking as the extra chairs and tables were rusting badly. The Adirondack chairs where nice but one had a leg that was loose and we were continually trying to put that back in place. The grill was in poor condition and we could not get it to light with the igniter and had no lighter to light it that way. I know this sounds negative but the unit is very nice and the view is absolutely awesome. The hot tub is well maintained and we would return here again. Very nice place with incredible views! We had 12 total and very comfortable accommodations for all! Had a awesome time! Pictures do not do this unit justice! Very well maintained and decorated and the VIEWS! All of the furniture and beds were so comfortable. Very nicely stocked kitchen. Loved the kitchen table and chairs! The outdoor furniture was AMAZING! Comfy and oversized. We spent every night out there (and quite a few mornings watching the sunrise)! Cannot say enough good things about the property! Loved, loved, loved it! Located on along the Gulf of Mexico, Orange Beach and Gulf Shores Alabama are small towns with BIG beaches! Our white sandy beaches are clean and orderly. There are many unique places to dine, shop and to be entertained. Many people return year after year to the Gulf Coast! We hope you will too! Come see why!